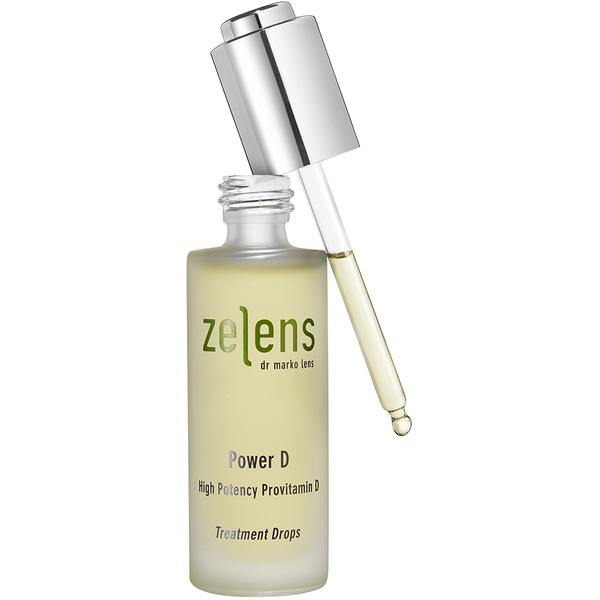 Restore and protect your skin with Zelens' Power D Treatment Drops, a high potency, anti-ageing formula rich in Provitamin D and bio-mimetic lipids similar to those found naturally in the skin. Working to replenish and fortify the epidermis, the concentrate expertly restores the skin's natural barrier and boosts resilience; skin is better equipped to combat external aggressors and free radical attacks to maintain a healthy, youthful-looking complexion. Infused with a proprietary botanical complex of powerful plant sterols, the treatment strengthens skin's resistance whilst plumping up for a supple, healthy appearance. Apply a few drops to your finger tips and massage into your face, neck, and décolleté. with your preferred serum or moisturiser. Provitamin D (7-Dehydrocholesterol), Phospholipids, Sterol Complex, Sphingolipids, Omega-3 And Omega-6, Soybean Sterols, Glycolipids, Proprietary Botanical Complex, Tripeptide, Chondroitin Sulfate, Hyaluronic Acid, Yeast, Vitamin E, Corn Oil, Geranium Oil.